ALEX FUN TOY - a trick toy particularly suitable for clever birds. This is the well known toy Alex Fun Toy, which challenges and enhances your parrot. EXPERT's HINT: In the nature, parakeets and parrots are a lot on the move and have plenty various activities, for example the search for food. Because of the early nurturing in captivity, they parrot loose these important behavior instincts. Therefore, it is very important to provide alternative occupations and distraction. With the acrylic toy collection from Wagner's, the parrot owners have found the perfect way to entertain their birds in a proper manner. Wagner's main target was to develop toys that support the bird's intelligence, toys that are goods of good value and safe for the parrots. 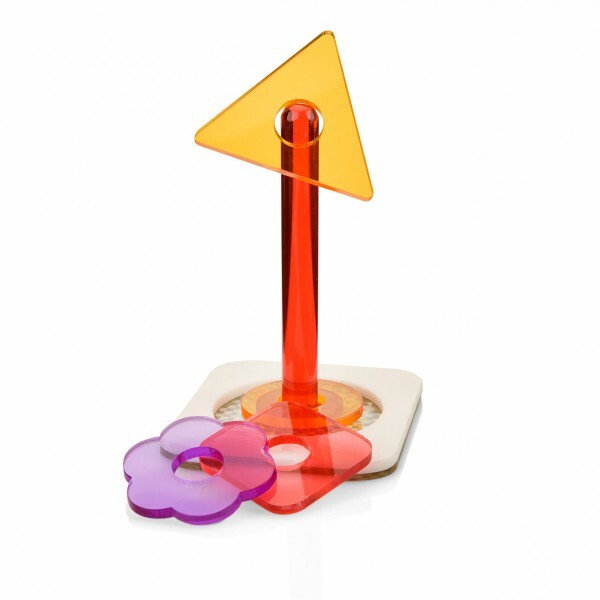 The main component of these toys is acryl, an almost indestructible and non-toxic material, the perfect alternative for wooden toys. The most reliable toys seem to be the ones with many moving parts and the treat hiding toys. Don't forget to switch every couple of weeks the toys, so the parrot's interest remains awake! links "Tricktoy "Alex Fun Toy" for parrots"
customer reviews on "Tricktoy "Alex Fun Toy" for parrots"
Schöne Verarbeitung. Stabilität ist auch in Ordnung in Anbetracht, das bei mir zwei große Aras damit arbeiten. Man sollte jedoch die Aras damit nicht allein spielen lassen, denn ein dunkelroter Ara bekommt die Förmchen zum Aufziehen schnell kaputt! Sehr schönes Spielzeug, kann auch einem Ara Schnabel durchaus stand halten.